Another Naptime creation for less than $15.00! 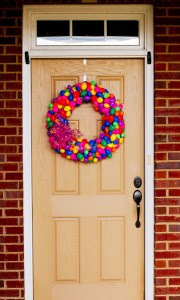 I saw on Pinterest an Easter Egg Wreath, it took me a bit to find the originator because it wasn't pinned correctly to give the originator credit or view the tutorial, but I think I found the originator "The High Heeled Hostess". This was so super cute, I had to make it!!! 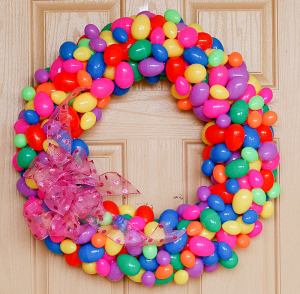 216 large eggs (18 bags with 12 eggs) + 69 small eggs (3 bags of 24 with 3 left over), a lot of hot glue (one mild burn) and a cloth covered wire frame and voila! It's soooo pretty!!! 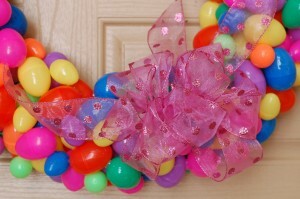 I made this wreath for less than $15.00 during naptime!!! !